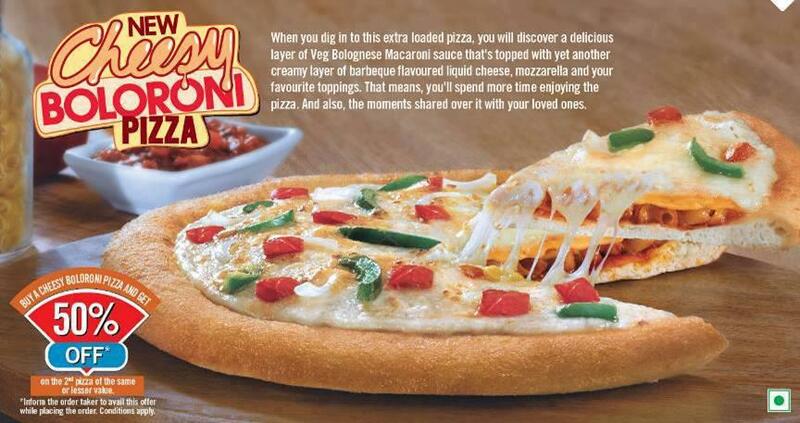 Domino's India's latest crust option is the new Cheesy Boloroni Pizza, "boloroni" being a portmanteau of "bolognese" and "macaroni." Yes, it's a pizza with macaroni and a vegetarian bolognese sauce (I'm super curious as to what they put in a meatless version of a meat-based sauce...). Specifically, the Cheesy Boloroni Pizza is a layered pizza starting with a layer of macaroni pasta and vegetarian bolognese sauce, which is then covered with barbecue-flavored liquid cheese, and finished with mozzarella and toppings. It's a bit like combining a pasta dish and a pizza all-in-one. I can't say this one sounds very appetizing to me at all. The barbecue-flavor cheese seems a very odd addition. If any of you are in India and have tried this, please share your experience below! That sounds really good. Vegetarian options tend to be kind of bland, though that sounds super fattening it sounds tasty. I love the size of the pizza they show two people sharing. Very reasonable.